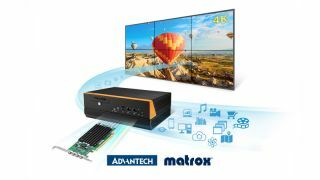 Advantech, embedded computing solution provider across multiple market verticals, has expanded its technology relationship with Matrox Graphics. Validated to work with Matrox's C-Series multi-display video cards, Advantech’s latest video wall solution, the DS-980 six-display system offers 4K content that is becoming increasingly in demand. The DS-980 streams up to six displays and delivers advanced high resolution, up to 4096x2160, true 4K content powered by sixth-generation Intel i7/i5/i3/Celeron rPGA processors and integrated Intel HD Graphics. With four of its graphics outputs powered by Matrox’s C420 graphics card, the DS-980 six-display signage solution enables system integrators to create video wall solutions with faster video streaming, increased stability, and flexibility for a wide range of enterprise, industrial, digital signage, security, and control room applications.